A 20 year retrospective catalog of Zachary Pullen. Produced alongside a show of the same name, at the Nicolaysen Art Museum. Containing over 100 paintings, sketches, reference photos, and several essays pertaining to Pullen's work and the illustration world as a whole. **Sample Text** "There is a common misconception that professional artists have it easy. They sit around the studio with tons of free time and, if they are up for it, may do a little painting for the day. No boss, no time sheets, no office cubicle – just freedom to spend the majority of their day conceptualizing their next great work of art. While the average person struggles with the 9-5 grind, an artist puts in an hour here and there. 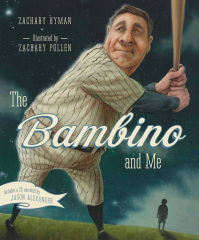 Oh the beautiful life of an artist, how sweet it must be...."
It’s 1927 and ten-year-old George Henry Alexander is full of the joys of summer: long days and warm nights, baseball, and most of all, the greatest player in the game, Babe Ruth—the Bambino. When George’s parents surprise him with tickets to a game between his beloved Yankees and their hated rivals, the Boston Red Sox, he couldn’t be more excited. A real baseball game, and his first chance to see his hero in the flesh! But when the big day arrives, things don’t quite go according to plan. On what is supposed be the best afternoon of his young life, George finds himself doing the one thing no true Yankees fan should ever do. He’s so low, he’d rather kiss a girl! How can he face his hero when he feels like the biggest traitor in the world? 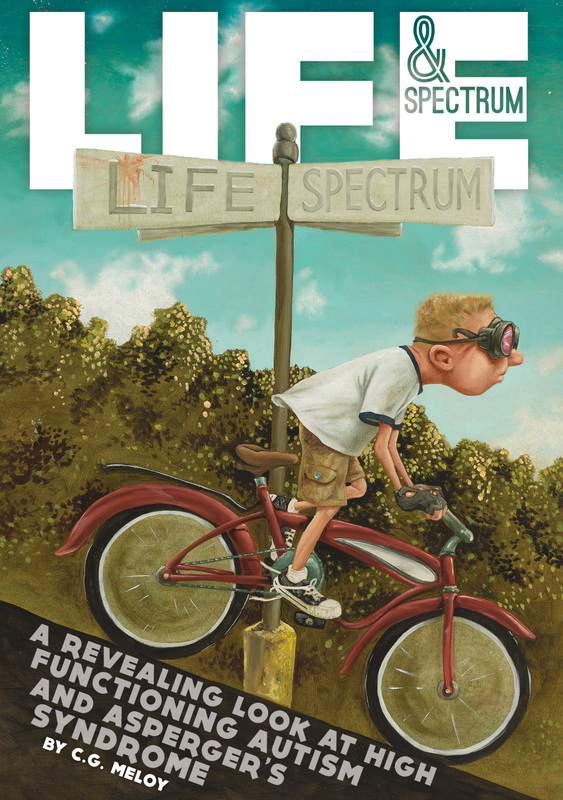 A revealing look at high functioning autism and asperger's syndrome. "Life & Spectrum", written by C.G. Meloy and illustrated by Zachary Pullen, is a unique book about living on the autism spectrum. It is not clinical, nor is it a biography. It is an experientially informed explanation of what living with autism can be like. The writing is candid, poignant and illuminating. The experiential nature of the material provides a deep understanding about the symptoms, characteristics and experiences of those on the tender spectrum known as Autism. 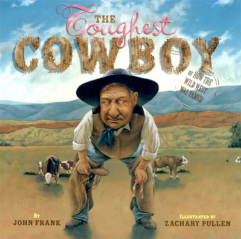 The book includes over 60 illustrations by award winning artist Zachary Pullen. In the mid 1800s the sport of baseball was working its way across the United States. Amateur teams were springing up and in 1858 the National Association of Base Ball Players was formed. Young men were eager to show their prowess on the field and in the batter's box. 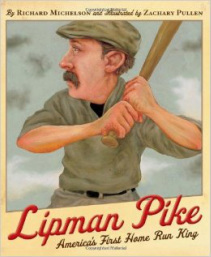 Lipman Pike's father, a Dutch immigrant, runs a small haberdashery in Brooklyn, New York, though Lip is more interested in watching the ball players than working behind the counter. His mother doesn't approve -- Jewish boys should be paying attention to more sensible matters. But when Lip is barely a teenager, he's invited to join the Nationals Junior Club and play first base. When he hits his first pitch over the right fielder's head, Lip knows baseball is the sport for him. There's no better feeling than strapping on a worn pair of skates and cutting across smooth, clear ice with sharp blades of steel. Add a black rubber puck, and an old wooden stick, and something special turns into something wonderful... HOCKEY! Almost everyone has heard of the Nobel Prize, a collection of prizes awarded for accomplishments in science, medicine, literature, and peace. But few people know about the man who established the award and for whom it is named, Alfred Nobel. Alfred Nobel was born in Sweden in 1833. A quick and curious mind, combined with a love of science and chemistry, drove him to invent numerous technological devices throughout his long life. But he is perhaps most well known for his invention of dynamite. Intending it to help safely advance road and bridge construction, Nobel saw his most famous invention used in the development of military weaponry. After a newspaper headline mistakenly announces his death, Nobel was inspired to leave a legacy of another sort. 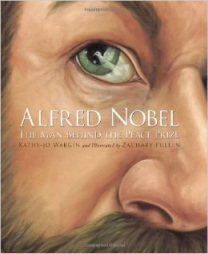 The Man Behind the Peace Prize tells the story of the enduring legacy of Alfred Nobel. After Casey wins the face off, it's up to Derek to make the tying goal. Can he do it ? The fans are on their feet as he speeds down the ice. He cuts inside, splitting the defense. He's about to shoot. Then CRASH! Here is a hockey yarn sure to bringreaders to their feet cheering for the underdogs. The 1958 NFL championship game is known to football fans as the "Greatest Game Ever Played." Featuring gridiron legends like Johnny Unitas, Frank Gifford, and Vince Lombardi, the Game marked the beginning of America’s infatuation with professional football. 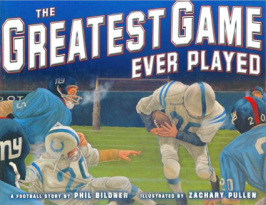 Now, Phil Bildner tells a heartwarming father-and-son story against the backdrop of this historic moment.When the New York Giants baseball team moves to San Francisco, young Sam discovers the other New York Giants—the football Giants. He convinces his skeptical Pop to come with him to the Game, and as Johnny Unitas engineers Baltimore’s legendary comeback, Sam and Pop rediscover the joy of rooting on their heroes together. Collection of Poetry for Children written by Gene Gagliano. Color jacket with Black and White interiors. A century ago, in 1913, the world's finest golfers gathered at The Country Club in Brookline, Massachusetts, to compete in golf's national championship, the U.S. Open. Joining them was a little-known amateur, 20-year-old Francis Ouimet, who lived across the street from the course and taught himself to play by sneaking onto the fairways with the only golf club he owned. His caddie? Ten-year-old Eddie Lowery, who stood only four feet tall. Together, against their idols and in front of a crowd that grew from a handful of spectators to a horde of thousands, they attempted to pull off the impossible. Along the way, they forged a lifelong friendship. In FRANCIS AND EDDIE award-winning author Brad Herzog and award-winning illustrator Zachary Pullen celebrate golf's most inspiring underdog story. What Seabiscuit is to the "sport of kings" Francis and Eddie are to the "gentleman's game." An introduction to some of history's most noteworthy and heroic animals includes illustrated profiles of President Adams' pet alligator, Balto the sled dog and Koko the gorilla. 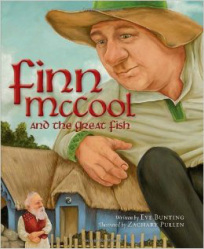 Finn McCool is the largest giant in all of Ireland. He's a fierce warrior, even beating the giant Culcullan and saving Ireland from the Scots. Helpful and kind, he helps the farmers bring in the hay. And everyone in the village of Drumnahoon admires him. "He's the best-hearted man that ever walked on Ireland's green grass." But for all his strength, courage, and goodness, there's one thing that Finn lacks. He's just not smart. And he knows it. When a wise man living in a nearby village tells Finn about a magical red salmon with the wisdom of the world, Finn sets out to catch the fish. And he learns a thing or two about himself in the process. An author of more than 250 children's books, Eve Bunting has won numerous awards and honors, including a Pen International Special Achievement award for her contribution to Children's Literature. In 2002 she was chosen to be Irish American Woman of the Year by the Irish American Heritage Committee of New York. She lives in Pasadena, California. 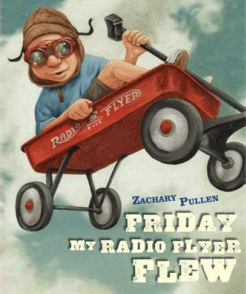 Zachary Pullen's picture-book illustrations have won awards and garnered starred reviews. 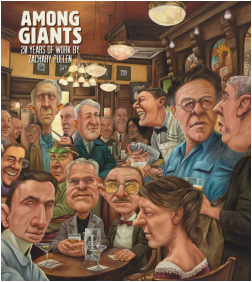 He has been honored several times with acceptance into the prestigious Society of Illustrators juried shows and Communication Arts Illustration Annual of the best in current illustration. Zak lives in Wyoming. What is a first draft? What is a narrative? 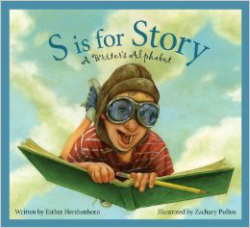 In S is for Story: A Writer's Alphabet, author and writing coach Esther Hershenhorn uses the alphabet to help explain, explore, and examine the tools, techniques, and strategies for those hoping to live the literary life. Writing terms and topics are explained using a two-tier format. C is for the Character, every story's star, the one for whom we cheer, we care, with whom we travel far. Specific genres, story elements (setting and plot), and the mechanics of how to write (including editing and revision) are covered, while quotes from famous authors provide examples of the writer's thought process. Budding writers of all ages will be inspired to put pen to paper (or fingers on keyboards)! What do you do with an old red wagon? Well, that depends. If the wagon in question is a trusty old Radio Flyer discovered while exploring the attic with your dad, and if you have a penchant for flying machines, then you may have just found the perfect way to get your dreams off the ground. How do you tame the roughest, toughest pack of cowboys to ever ride the open range? Taught by Ron Mombello, an acting coach for over 20 years, and illustrated by Zachary Pullen, a renowned artist, Volume 1 of The Better Attorney is a correspondence course - workbook which will teach you how to engage your audience, how to communicate more clearly and concisely, how to be better understood, and, therefore, how to be better at your practice of the Law. This Course will guide you there, and, then, not unlike the aims of the actor, each of your cases will be worthy of an Oscar®. The techniques an actor masters will work for you. A collection of all the pencil drawings for the painting by the same title. All Images Copyright Zachary Pullen unless otherwise noted.